Popular myth credits the Russian chemist, who created the periodic table of elements, as the inventor of vodka. 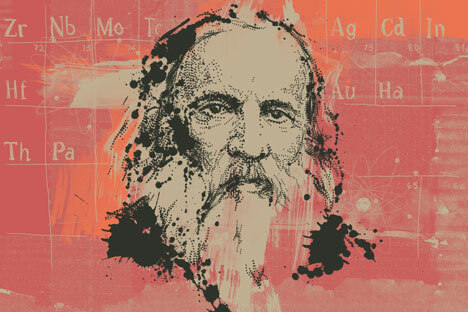 Dmitri Ivanovich Mendeleev (1834-1907) a Russian chemist who created the periodic table of elements. The table went on to have the same transformative effect on the world of science as the invention of electricity. Popular myth also credits Mendeleev with the invention of vodka. It is believed that prior to Mendeleev alcohol content in vodka was largely random, whereas he was the first to calculate the optimum figure of 40 percent. The rest, as they say, is history. Mendeleev himself did not consider himself to be a chemist. And rightly so. Back in those years the word "chemist" was synonymous to conman and the expression "to do chemistry" (khimichit in Russian) meant to dupe, to cheat. Mendeleev had his fingers in many pies. He made leather trunks, he invented smokeless powder, he advised tsar's ministers, he flew in a hot-air balloon, and he even taught famous poet Aleksandr Blok how to write poetry. When Blok came to ask Mendeleev's permission to marry his daughter Lyuba, Dmitri Ivanovich sat him down on a sofa and began reading Pyort Yershov's "The Humpbacked Horse" to him, as if trying to impress Blok with the idea of what true poetry should be like. The story with the hot-air balloon went as follows: Mendeleev decided to observe a solar eclipse from a hot-air balloon called Russky. He was supposed to be accompanied by a lieutenant Kovanko. It was an overcast day, with a miserable drizzle coming down from the sky. Mendeleev and Kovanko got inside the gondola and cut the cable, but the balloon did not move. Mendeleev began to throw everything out the cabin: planks, a stool, and a suitcase. Getting down to the bottom of the cabin, he began to throw out wet sand with his two hands. It was no use. "Get out. I'll go on my own," he told the young officer. A minute after the balloon was off the ground, it disappeared into the clouds. It was getting dark. Mendeleev's wife felt unwell and had to be taken home. The anxiety became worse when somebody sent a cable saying, "The balloon has been spotted, but no sign of Mendeleev." The anxiety was well justified. Having watched the eclipse, Mendeleev decided it was time to go down. But he was unable to do that. The rope leading to the gas valve was tangled. Trying not to look down, Mendeleev climbed out to stand on the edge of the cabin and, desperately trying to keep his balance, untangled the rope. A heavy, thick woolen coat and his tall hunting boots did not help against the cold. There he was: a stooping, clumsy 53-year-old-man above the clouds. He felt dizzy, there were little red dots jumping in front of his eyes. A little while later, after some gas escaped from the balloon, it began to go down. When the balloon landed, a local village head rushed to the scene. "Are you a spy?" he asked Mendeleev. "Well, Mr. Scientist, why don't you disappear and I will look after your 'bubble' here," the village official said. In all probability, the village head at that moment in time was under the influence of "Mendeleevka," the traditional, 40-percent Russian vodka.